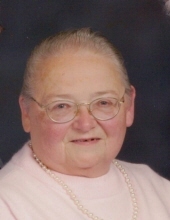 Mary Elizabeth Bell, age 79, of Westminster, went to be with her Lord on Thursday, November 15, 2018 at the University of Maryland Medical Center. Born May 23, 1939 in Comus, MD, she was the daughter of the late George and Emily Horner Nicholson. She was the wife of I. Webber Bell, her husband of 57 years. Mary was a member of Chapel Lutheran Church. She was very dedicated to her family. She never asked for anything for herself and had a special little laugh that will truly be missed. She was the best babysitter ever and was known as “NanNan” to all her grandchildren and great-grandson. She enjoyed baking, canning and making her famous jams, jellies and breads. Surviving, in addition to her husband, are daughter, Dawn Raver and husband Glenn of Manchester; sons, Dwayne Bell of Keysville, Ryan Bell and wife Ruth of Hampstead; grandchildren, Thomas Raver of Hampstead, Johnathon Raver and wife Mona and Benjamin Raver and wife Stacey, all of Hanover, PA, Pam Bell of Germantown; Ross Bell, Shelley Bell and husband Brian Knouse and Robbie Bell, all of Hampstead and great-grandson, Mason Raver; sisters, Margaret Schooley and husband Ray of Marshfield, MO, Kathryn Kline of Thurmont; and brother, George Nicholson Jr. and wife Sandy of Woodsboro. The family will receive friends at Hartzler Funeral Home-Libertytown, 11802 Liberty Rd., Frederick on Sunday, November 18 from 1 to 4 p.m. A funeral service will be held at Chapel Lutheran Church, 11109 Daysville Road, Frederick on Monday, November 19 at 11 a.m. Rev. Gordon Narvesen, church pastor, will officiate. Interment will follow in Chapel Cemetery. To send flowers or a remembrance gift to the family of Mary Bell, please visit our Tribute Store. "Email Address" would like to share the life celebration of Mary Bell. Click on the "link" to go to share a favorite memory or leave a condolence message for the family.